my spring chicken | eating with S.O.L.E. It’s that time of year again, when I take up the Birthday cake challenge my daughter set forth and this year was a doozie! 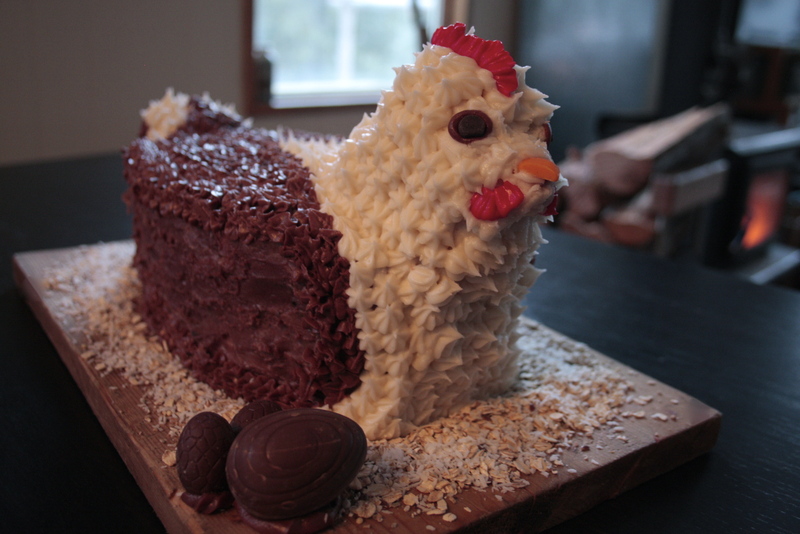 She requested a chicken cake, and not just any simple cute sheet cake chicken… but a 3D rendition of one of our Wheaten Maran Hens, which just happen to lay lovely dark chocolate brown colored eggs. Yikes, I am swamped with feeding a hungry man-crew of builders 2 meals of day, drowning in client work, fighting off a bug and prepping for Birthday weekend for my 11 year old chicken lover, and had to take on the 3d chicken challenge. I started with old faithful, the Joy of Cooking’s, white cake recipe, which I am certain is what my grandmother used for the dozens and dozens of wedding cakes she pumped out in my youth, when I was the child labour icing rose maker! You know when ever I need something that will certainly work or I am roasting some new cut of meat, or need to source out a real classic, I turn to the joy of cooking, In fact if I am honest it is one of the ONLY recipe books I actually follow without question. So I busted out a double batch (OMG huge) recipe for white cake, and it called for 16 egg whites! Good thing we have flock of happily laying hens to contribute hugely to this recipe! I probably didn’t need to double this already GIANT recipe, because I ended up with my massive roasting pan full of sheet cake along with 18 mini cupcakes and a bunch of extra bits and bobs, but like I said I have a huge hungry working crew of guys to feed right now… So more cake is indeed better! 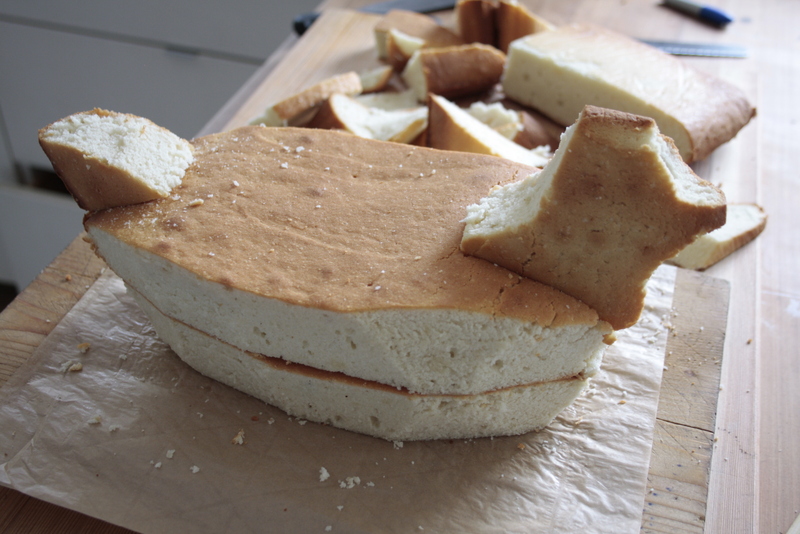 I cut the sheet cake into 3rds and starting by stacking 2 rectangles atop one another, I then eyed up the profile and free hand sketched a chicken head and tail onto a piece of cardboard and cut the last 3rd into head and tail tip. I inset the head into the second cake to offer extra stability and then I set to work rounding the rectangle into a setting chicken shape. This semi chicken shape got a slather of a good firm buttercream frosting and was left to set up for a couple hours before I really got decorating. 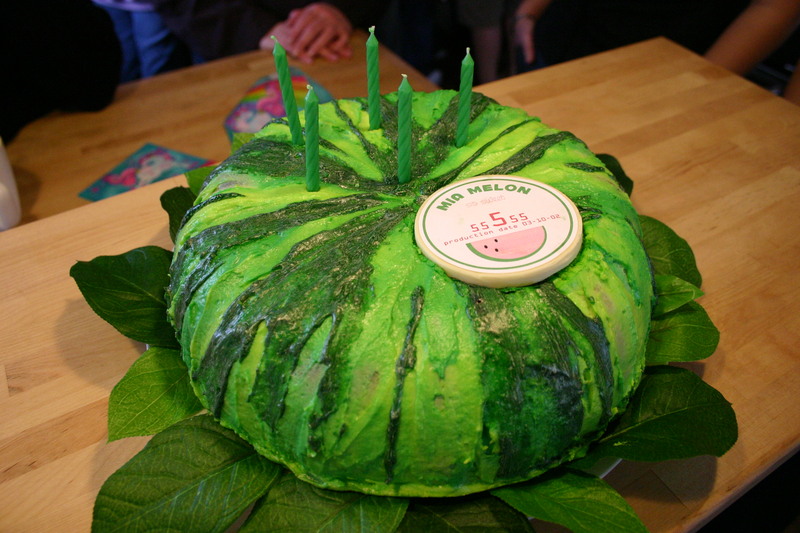 As my daughter and I were reviewing some birthday cakes from years past I realized a trend, all of the cakes she has asked for since her 3rd birthday have been made to look like other foods; hamburger cake, sushi petit-fores, watermelon cake, popcorn ball cake, and now a chicken.. albeit a hen, yet my daughter is the first to understand and enjoy the cycle of life on our little smallholding, when old birds and many roosters hit the roasting pot when the time calls, so in essence this cake to is “made to look like other food”, just on happy healthy and well loved step away from the table. 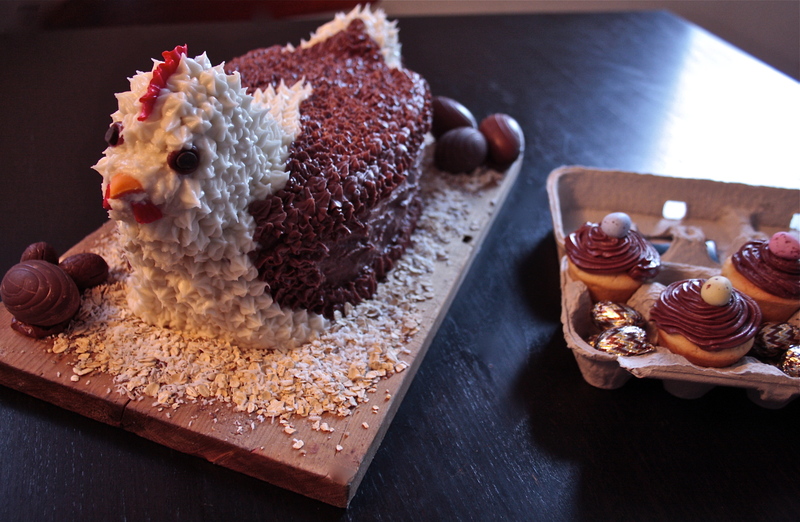 I hummed and hawed over what piping bag tip was most feather like and settled on a few variations and with my daughters help we managed to produce a pretty like resemblance to one of our maran hens, complete with chocolate eggs and a bed of oats and seeds. We piped up the cupcakes, adored them with mini eggs and set them in a egg carton for the perfect cake stand. Wow – that looks finger lickin good!!! Happy Birthday Mia!